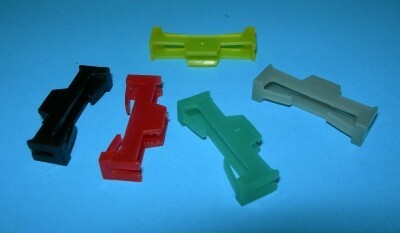 2 clips for locking together important connectors. Invented by Dave Thacker of Radical RC. The lightest weight and simplest connector lock ever made. Easy snap on and off, retains connector against vibration or accidental separation. Keeper is retained on female side of plug assembly and can't be easily lost in the grass or fuselage. Designed to slip through existing wing tubes and past snags. Only one is required, however, you can actually fit two on each connector assembly. 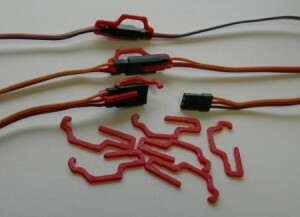 Compatible with all brands of servo connectors. Patent Pending. Nifty Keeper for RC plugs and sockets. Prevent your connections from coming loose in flight due to vibration. Pack of 10. Bright safety yellow. Easy to see in preflight inspection. The New Sonic-Tronics Nifty Plug & Socket Keeper is a safety clip designed to keep servo and plug connectors from disconnecting accidentally. 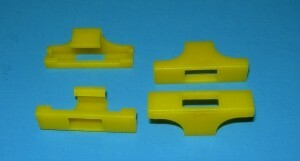 There are 10 safety clips per package. Side lock keepers slide over the side edge and lock on. Easy on and easy off. Suitable for frequently removed plugs or permanent installation. 5 pieces per bag. May come in mixed colors. Easy on and easy off. Snaps over broad side of connector, captures ends without interfering with wires. Suitable for frequently removed plugs or permanent installation. 4 pieces per bag. May come in mixed colors.